This newsletter goes out to all leaders and adult members but it doesn’t get to parents and children so please can you pass on any relevant info, or just send them a copy. Floors are going down this week and we are on course for Family Camp. Most of the builder’s rubbish has gone and the Monday Crew are setting about titivating the outside areas. Thanks to Adam Meara, Adam Chambers, Rick Lawrence and Glen Tofts all leaders from the 12th who entered Farnham Cyclethon and raised over £500 for Bananas. Thanks also to Matt Saker a leader at the 8ths who is running The London Marathon in aid of Scout charities including 50% to Bananas. Matt is trying to break the Guinness World Record for the marathon run in Scout uniform. Watch out for him on TV and more importantly go to his funding site and sponsor him. 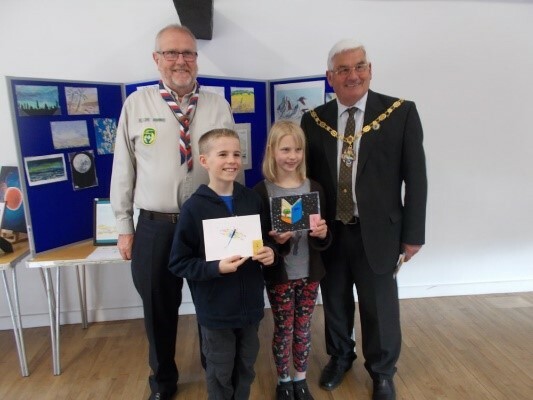 “Many of you will know I’m a keen runner….fewer will be aware that in my spare time I help to run my local Scout group. Although at a little over 2 hours the marathon world record is perhaps a little beyond me(! 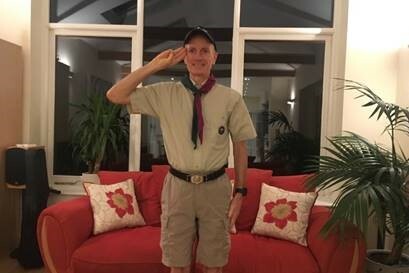 ), in 4 weeks’ time I will be putting on my Scouts uniform (see picture below) for the Virgin London Marathon in an attempt to break the current Guinness World Record for running a marathon in full Scouts uniform, which stands at a very challenging 2 hours 58 mins 44 secs. The money I raise from my World Record attempt will go to the Scouts Association Nationally, which helps 460,000 boys and girls in the UK from every background to develop the values, self-belief and faith in others that will help them mature into confident, resilient and active adults. Locally, half the money raised, will go towards our local Scout Activity Centre Building project at Garners Field, Farnham, Surrey. No pressure at all, but if you’d like to sponsor me in this attempt then please follow the link below. Was a great success well done everyone. 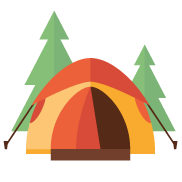 Pioneering, fire lighting, axe and knife skills, backwoods cooking, hammocking, archery, shooting and a good number of rafting permits gained. Thanks to Eric Goulding and Dominic Getting, shall we do it again next year? We had a brilliant exhibition with well over 300 exhibits and lots of visitors. Thanks To Janet and John Fraser and their team. 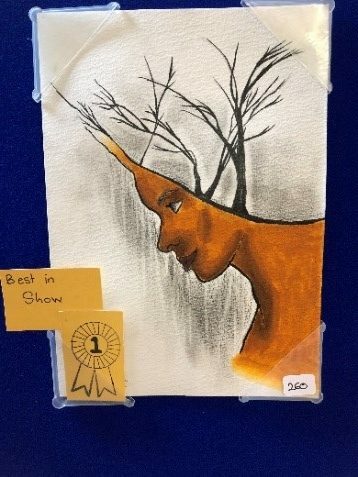 Thank you also all the talented artists and to The Mayor David Attfield who was chief Judge. Advance bookings are now closed but you can still come on the day (£15/head). Adults who want to camp will need a current Scout DBS. I’m looking forward to hearing what activities each group has arranged. By popular demand we are getting the band together again for Family Camp. All musicians who are grade one and above and can cope with a couple of sharps are welcome. Beavers, Cubs, Scouts, Explorers, Network, leaders and parents are all welcome. There will be a rehearsal on Sunday morning 28th of April and the performance at St Georges Day that afternoon. There is a quiz going round, get your copy from the Scout Shop or at Family Camp £2.00 a go. Anyone got a nice single bed for our new first aid room? 2nd May Sasu back at Garners! 22nd June SCRAM County Cub Day.